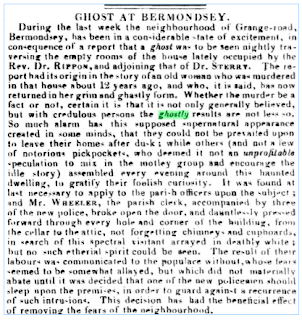 This time we find ourselves in 1830, on 8th July, to be exact, where The Morning Post brings us the story of a murder victim who returned from the grave to terrify the people of Bermondsey... can the police save the day? 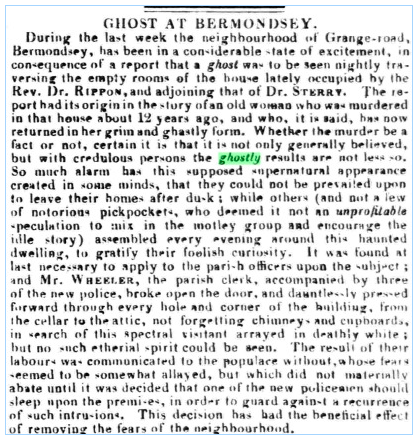 During the last week the neighbourhood of Grange-road, Bermondsey, has been in a considerable state of excitement, in consequence of a report that a ghost was to be seen nightly traversing the empty rooms of the house lately occupied by the Rev. Dr. RIPPON, and adjoining that of Dr. STERRY. 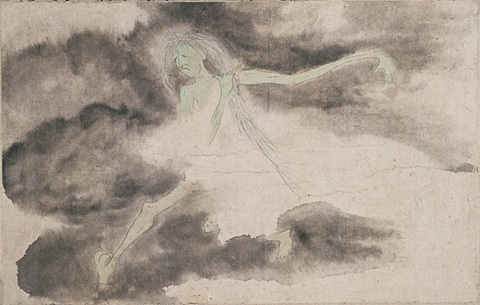 The report had its origin in the story of an old woman who was murdered in that house about 12 years ago, and who, it is said, has now returned in her grim and ghastly form. Whether the murder be a fact or not, certain it is that it is not only generally believed, but with credulous persons the ghostly results are not less so. So much alarm has this supposed supernatural appearance created in some minds, that they could not be prevailed upon to leave their homes after dusk; while others (and not a few of notorious pickpockets, who deemed it not an unprofitable speculation to mix in the motley group and encourage the idle story) assembled every evening around this haunted dwelling, to gratify their foolish curiosity. It was found at last necessary to apply to the parish officers upon the subject; and Mr. WHEELER, the parish clerk, accompanied by three of the new police, broke open the door, and dauntlessly pressed forward through every hole and corner of the building from the cellar to the attic, not forgetting chimney and cupboards, in search of this spectral visitant arrayed in deathly white; but no such ethereal spirit could be seen. The result of their labours was communicated to the populace without, whose fears seemed to be somewhat allayed, but which did not materially abate until it was decided that one of the new policemen should sleep upon the premises, in order to guard against a recurrence of such intrusions. This decision has had the beneficial effect of removing the fears of the neighbourhood. no follow-up saying what happened to the policeman? None, so I assume all was well! Interesting, I like Ghost stories. In your newspaper this morning?